Today, at 3:30 p.m, the Florida-Georgia Football game is played in Everbank Stadium in beautiful Jacksonville, Florida. My Florida Gators have had a tough season this year (2014). We've lost some tough games and some of our stars haven't reached their potential. Our coach Will Muschamp is definitely on the hot seat. However, I hope that the Gators can overcome their problems and come together for an upset victory over the Georgia Bulldogs. It would be a stunning upset and there's nothing more fun than upsetting a football rival. 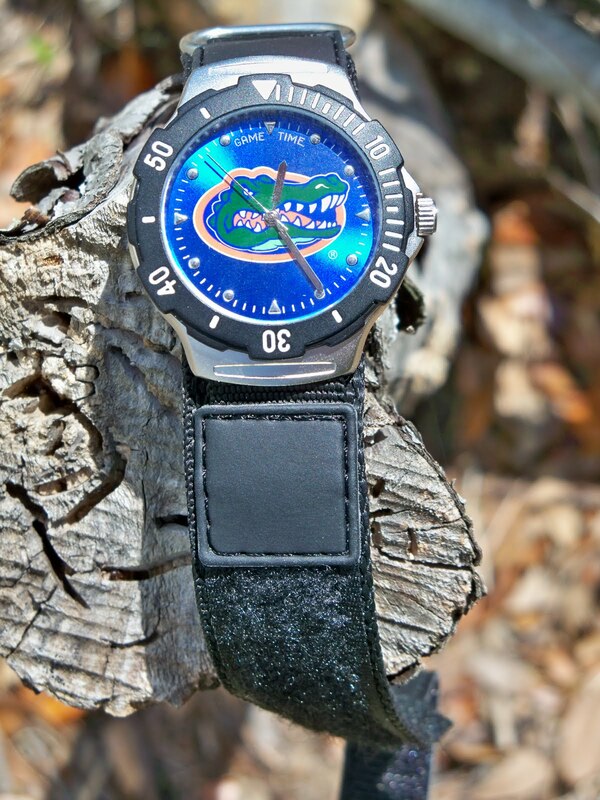 My official watch for today's game will be one of Game Time's Florida Gator watches with our toothy logo front and center. Amazon.com has a ton of them! However, Bulldog fans shouldn't fret. They can get a wristwatch of their own. Of course, they may need to get someone to help them learn to read it. This one is super fashionable. How did the 2014 Florida-Georgia game turnout? The Florida Gators surprised Georgia with a fake field goal for a touhch down and then chomped down on the Bulldogs. They never let up with an amazing running attack and beat them 38-20. As a English major who graduated from Florida in the late 80s, I know victory doesn't make the hero. Overcoming adversity, facing challenges, suffering set backs and then rising to victory makes heroes. I hope that the team enjoys the winning feeling. If they persevere, fight hard and win many of the remaining games, they'll be bowl bound!